At San Diego State University we seek to make research open, accessible, and encouraged for all our students, including people of color, those with disabilities, first-generation students, veterans, those from low-income families, and females. SDSU is proud to be designated as a hispanic-serving institution by the U.S. Department of Education. In an effort to provide an inclusive environment for all of our students, SDSU offers several programs run by brilliant university faculty, researchers, and student-focused coordinators that aim to help underrepresented groups succeed in research careers. Three students affiliated with the Maximizing Access to Research Careers program received NSF fellowships this year. 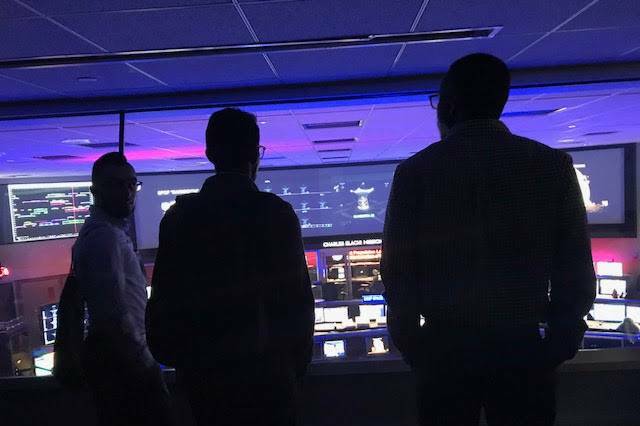 Mathematics, Engineering Science Advancement students recently visited the NASA Jet Propulsion Laboratory. The Aztec Research Fellowship funds social science research by undergraduates and helps create opportunities for students to present their research at conferences! 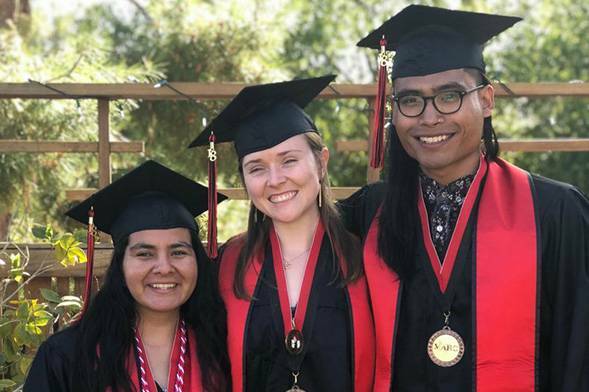 MARC has supported 133 underrepresented students in its 28-year history at SDSU, and 90 of them ultimately received fellowships to help fund their graduate education. The program’s goal is to encourage a diverse array of students to pursue research careers. Student participants have written or contributed to more than 60 published academic papers. Most notably, in the last four years, every graduating senior involved in MARC matriculated into doctoral programs. Funded by the National Institutes of Health, MARC is designed for juniors and seniors and accepts five high-achieving students per graduating class. Participants receive tuition scholarships, and stipends for research activities, supplies, travel, and housing. Students are required to participate in a research lab, present their work at SDSU’s annual Student Research Symposium, attend research-related conferences in their field, and apply to graduate school. They also attend workshops on succeeding as a minority in STEM fields, take courses on ethics and scientific writing, and are encouraged to study together on campus. IMSD accepts about 25 underrepresented sophomores, juniors or seniors each year and participants receive hourly wages for their research time (up to 20 hours during the semester and 30 hours in the summer). Roughly 90 percent of participants go onto graduate school. IMSD students are required to participate in a research lab, present their work at SDSU’s annual Student Research Symposium, attend research-related conferences in their field, and apply to graduate school. They also attend workshops on succeeding as a minority in STEM fields, take courses on ethics and scientific writing, and are encouraged to study together on campus. IMSD is funded by the NIH. A cousin of the Maximizing Access to Research Careers program, this program is aimed at introducing underrepresented first- and second-year students to research and mentoring. Students participate in a six-week summer enrichment program and a hands-on laboratory experience. The program is funded by the NIH. CASA includes 17 distinct support programs which span the different departments in the College of Sciences and the College of Engineering. These programs collaborate to provide underrepresented students with opportunities to tailor their education, and are as diverse as the students they serve. There are programs that provide support to students in all educational levels, including transfer and graduate students. This program, in existence since 1993, provides funds for international summer research experiences for qualified undergraduate and graduate students interested in biomedical sciences, medical anthropology, and public health. Participants have researched at institutions in Peru, Taiwan, and Uganda. Funding comes from NIH. This program enables SDSU to offer short-term international research training opportunities to undergraduate and graduate students from health disparity backgrounds, which includes minorities and other underrepresented and underserved populations in health research. For more than 30 years, the MESA program has supported underserved students to become engineers and physical science professionals. During the 2018 academic year, MESA served 247 students! The program provides academic support, out-of-classroom experiences and industry and alumni engagement. These experiences help students succeed academically and develop professionally. MESA students engage in high-impact experiences, such as undergraduate research, first-year seminar, and leadership development. SDSU MESA is a postsecondary component of MESA California. This program, funded by the National Institute of Aging, is designed to recruit disadvantaged and underrepresented SDSU students who are interested in the field of aging and prepare them for entry into a doctoral program. Participants must enroll 3 years before graduating and have a 3.0 GPA or higher. Students get to work with research mentors, participate in summer research programs, attend networking events, and receive funds for research supplies and travel, as well as paid research lab time. This program, funded by the state, aims to encourage a diverse set of students to participate in regenerative medicine research. Students obtain hands-on experience in stem cell research and guidance from mentor researchers. The program promotes collaboration between SDSU and local research-driven institutions and companies through monthly colloquiums, research seminars and a twelve-month internship for each BSCRIP Fellow, which includes a monthly stipend of $2500. The program is open to junior and senior students and first-year graduate students pursuing a degree in Biology, Biochemistry, Microbiology or other relevant health or natural science. This program assists and provides support to community college students transferring to SDSU and interested in research. Students have participated in research at NIH, Harvard University, and Scripps Research Institute, among other places. This is a NIH funded program. Learn more about BRIDGES here or contact the BRIDGES coordinator. The goal of this program is to broaden participation in STEM disciplines, and encourage more students to pursue graduate degrees in STEM fields. The program has been at SDSU since 1994 and includes academic advising, scholarships, book loans, GRE Prep and research participation stipends. Learn more about the Louis Stokes Alliance for Minority Participation here by contacting the coordinator, Thelma Chavez. A cousin of the Initiative for Maximizing Student Development program, this program provides first- and second-year students with opportunities to engage in biomedical and behavioral research, mentoring, and pre-graduate school resources. Students will gain hands-on research experience, obtain early preparation for a Ph.D. program, and become competitive candidates for the IMSD program. Participants must conduct research alongside a faculty mentor at least five to 10 hours a week, depending on the season, and attend seminars and workshops. Each Pre-IMSD scholar will be matched with a peer mentor (a senior IMSD scholar on track to apply directly to Ph.D. programs). 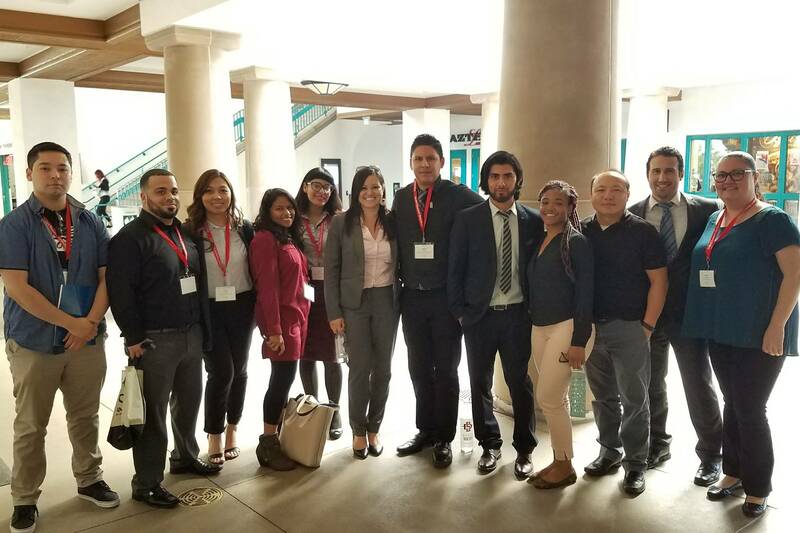 The Aztec Research Fellowship Program offers undergraduates an opportunity to conduct social science research in an effort to increase the pipeline of historically marginalized students who pursue graduate degrees. Students receive funds to travel to conferences. They also receive faculty mentoring, the opportunity to participate in scholarly publications, and exposure to ongoing research projects. The fellowship is not currently accepting new fellows. Professor Marissa Vasquez is the coordinator. The Partnership Scholars Program provides research experience and training for 12-16 undergraduates with diverse majors including basic sciences, public health, and psychology, among others. Partnership Scholars receive stipends to train with cancer research projects at SDSU and UCSD (up to 40 hours per week in the summer and 10 hours per week during the academic year). In addition to their stipends, scholars also benefit from support for conference presentations, an annual cancer Journal Club, a summer workshop, and other opportunities. Learn more about the Partnership Scholars Program.